From the moment I first knew I wanted to come to Israel on OTZMA, I was excited about living in Tel Aviv for Part 3 – the beach, the big city, the food. I didn’t yet know what kind of internship I was looking for, but I figured I would find it in Tel Aviv. But the more I thought about it, the more I realized I needed to be in Jerusalem. It wasn’t just that the places that interested me most were here, although from a practical standpoint that certainly contributed to my decision. But the real reason lies in the importance of Jerusalem to the Jewish people. It is here that the two Temples stood, and to here that generations of Jews prayed to return, to this day facing Jerusalem and the Temple Mount specifically during prayer. So it is this connection to Jerusalem that made celebrating Yom Yerushalayim so special. It began Tuesday night with the Yom HaStudentim/White Night concert in Gan Sacher featuring an odd yet entertaining lineup of Israeli and American bands, from Hadag Nachash to 70s funk band Kool and the Gang. But the real highlight was the sunrise performance by Ehud Banai, a Jerusalemite and one of Israel’s most well-known and respected singer/songwriters. The entire Banai family still lives in the city, and Ehud has written several songs about living here, particularly “1 Haagas Street” about his home right by the Machane Yehuda shuk. Flash forward several hours to Wednesday evening and the unbelievable scene at the Kotel. Jews of all kinds – young, old, Ashkenazi, Sephardi, haredi, hiloni/secular – joined together, proudly hoisting Israeli flags and dancing at the the Kotel plaza, celebrating 43 years of the reunification of Jerusalem, and the ability of Jews to return to the Old City, something denied during the 19-year Jordanian occupation of the city from 1948-1967. Celebrating Yom Ha’atzmaut on the streets of downtown Jerusalem was great, but it didn’t compare to the emotion, the pure joy, that I experienced and watched everyone around me experience at the Kotel. 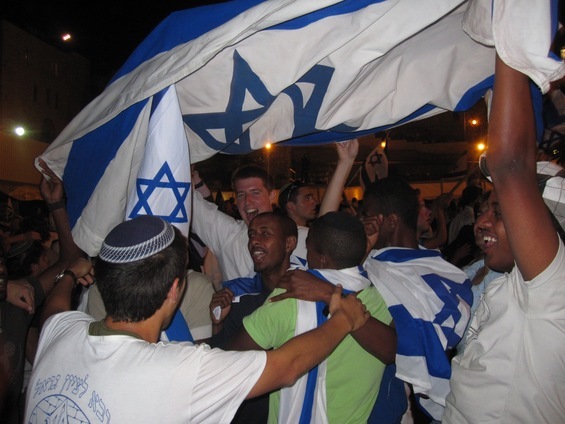 This is the very essence of Zionism – the right of the Jewish people to be free in our homeland, the State of Israel, and Jerusalem, the eternal capital of the Jewish people, and it’s no coincidence that the root of the word Zionism, Zion, is one of the Biblical names for Jerusalem. We no doubt hold different opinions when it comes to politics, religion and how Israel should proceed from here, but the importance of Jerusalem to our past, our present, and our future couldn’t be more clear.